We got used to thinking that classics implies something pretentious, stiff and binding. Something like loads of gold and brocade, massive furniture, dense drapery and so on… But is this always the case? Of course, not! 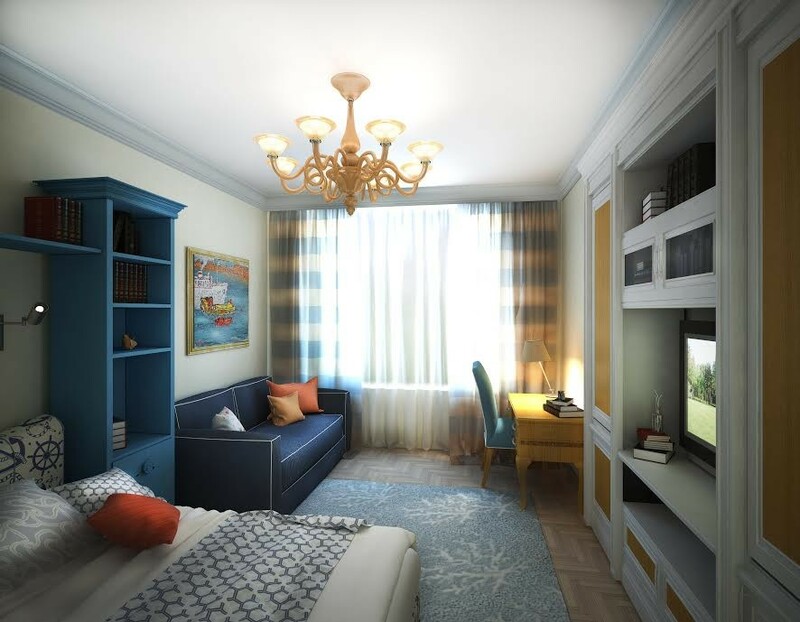 To release you from this stereotypical thinking we’d like to show you an interior project of a three-room apartment designed in classical style and filled with bright colors, airiness and the spirit of Parisian romance… O la la! This apartment is newly-built and has a free-pattern layout. It’s meant for a family of three – the spouses and their son of school age. 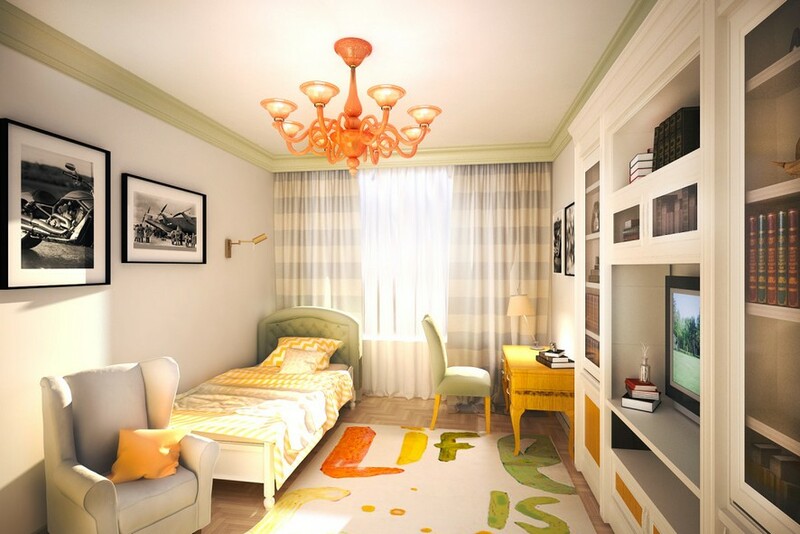 The living room is open to the kitchen, and also there’s a master bedroom and a room for a kid. 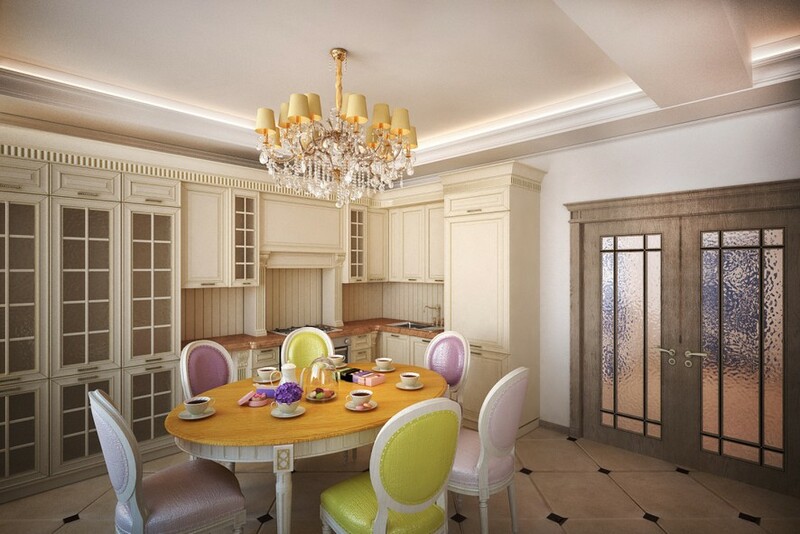 The project is prepared in neo-classical style. Both the author and the clients felt that it should be arranged in a light color scheme and be free from excessive details. At the same time, the designer noticed that the masters tend towards unostentatious magnificence, which is typical of apartments with a history. That is why the project features many moldings, mirrors, herringbone parquetry pattern and chandeliers with crystal décor. With classics in mind the door apertures were made a little bit higher than standard – 2.3-meter-high, while the ceiling height is about 3 meters. Besides, the doors were complemented with decorative cornices, which made them look even more Parisian-style. In the living room and hallway the walls were just painted white – in the company of moldings such a solution looks festive and unostentatious at the same time. The neutral light background created a great couple for bright accents: mismatched dining chairs and a blue loveseat by the window. The centerpiece of the lounge area is a cozy fireplace. 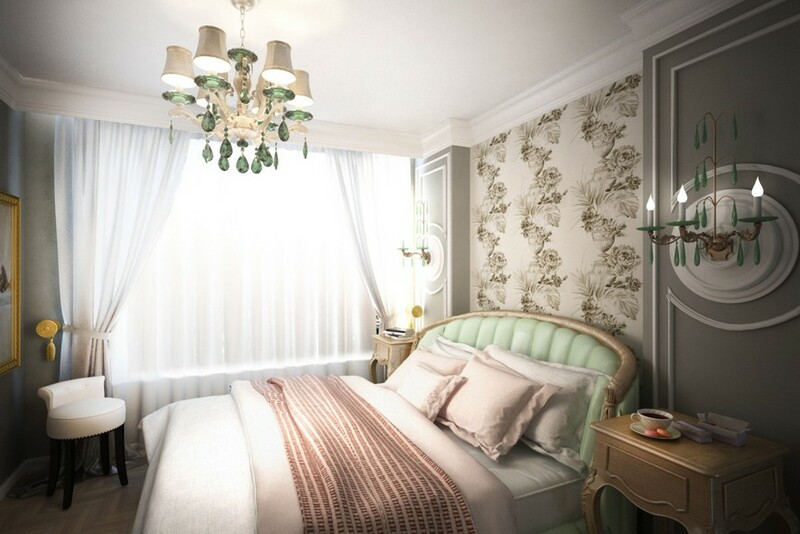 Chosen as dominating for the bedroom interior was quiet light color palette. The role of an accent is played by classical floral wallpaper behind the headboard. It’s coupled with a matching fabric in the walk-in closet from the same collection by Designers Guild. Thanks to the ideal location of the windows and load-bearing walls in the flat, the layout allowed for creating one more, fourth room – pretty tight, yet equipped with two full-fledged windows. The designer suggested two options for it – a work area or a walk-in closet. 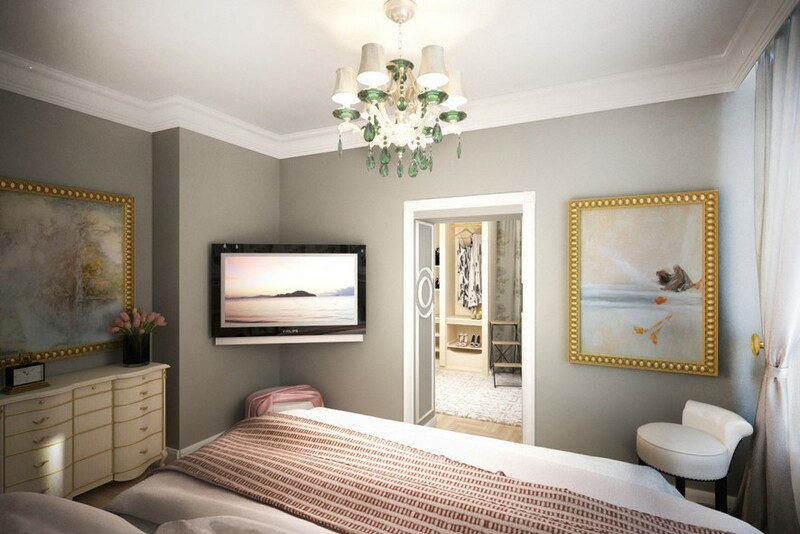 The clients preferred the second option, and the hostess may now boast having a gorgeous boudoir of her own. 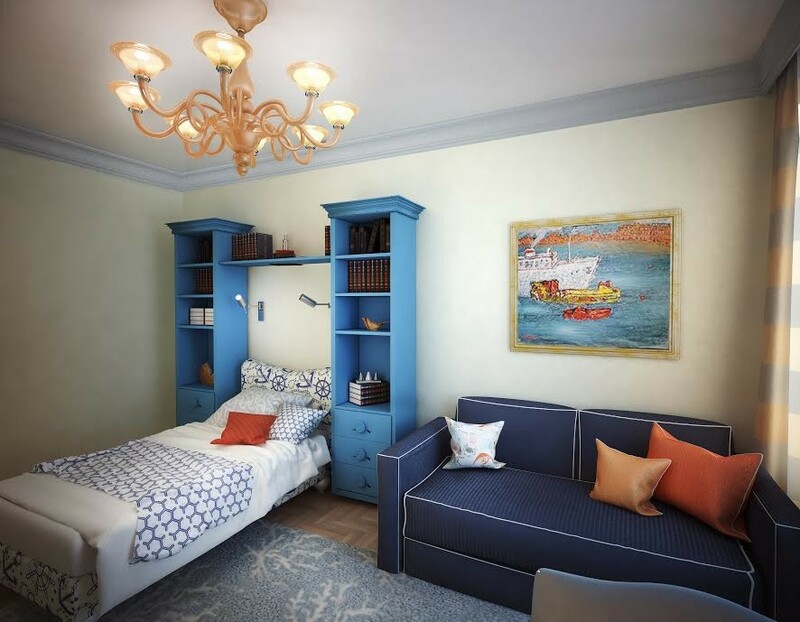 The clients would like to see their son’s bedroom in traditional boyish bluish tones, but the author of the project offered them both the desired blue interior and a fresher orange-and-green option. To crown it all, the renders have different layout options and the clients have a nice chance to make the right decision. 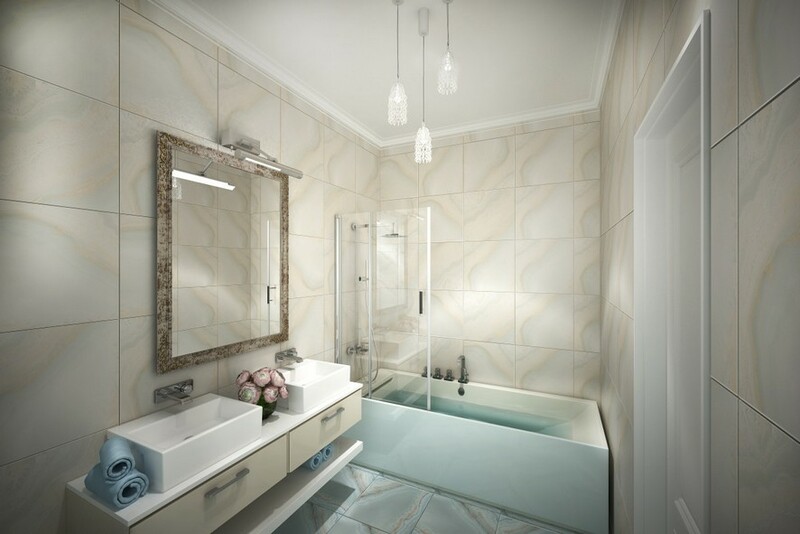 When it came to bathroom interior design, both the masters and the designer had their hearts set upon laconic design and natural colors and textures. By the way, such a trick is quite common for classical-style houses and apartments: classical elements are traditionally concentrated in the rest of the spaces, while the bathroom is designed in a more reserved style and color range. The centerpiece and the starting point of this interior is the Beyond Collection of wall tiles by Aparici.